The principles, strategies, and technologies surrounding web design are dynamic. So much so that if you’re “on time” in the digital world, you’re already behind. Staying up to date on the latest design trends, learning about upcoming web development opportunities, and having your finger on the pulse of all things digital has become the rule, rather than the exception. To be successful, you have to find a way to ensure that your site is in sync with current web design technologies and internet best practices. At the same time, if you aren’t able to be flexible with your site and make adjustments according to current state of online affairs, your business may be will be left in the dust. Below are five classic signs that your current website may be outdated. According to a digital experience survey conducted by Kentico, 44% of users will never return to website that aren’t mobile-friendly. The survey also found that 76% of smartphone users and 78% of tablet users return often to websites that look good and work well on their mobile devices. Still need some convincing as to the importance of updating your site’s mobile functionality? 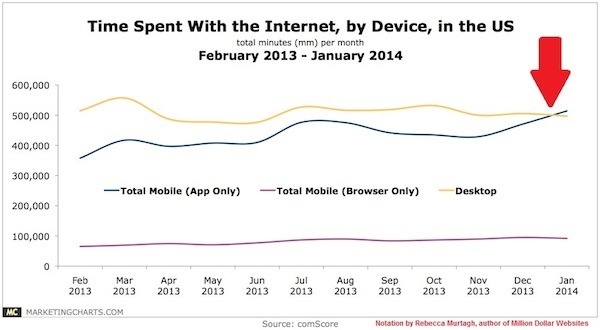 Last summer, mobile exceeded PC internet usage for the first time in history. The bottom line: ensure that your site is mobile-friendly so you won’t be missing out on potential customers. No links to your social media accounts on your website? No ‘share this’ feature on your blog posts? Not good people! Facebook, Twitter, YouTube and LinkedIn are some of the most important online channels for businesses. Millions of people connect on these sites everyday, so they are the perfect places to network, connect with customers, and build a loyal following. It isn’t enough to simply have social media accounts and link to them on your website. You need to be an active participant in these communities in order to get the full benefit that they can provide. Remember when “good content” basically centered around how many keyword you could stuff in the copy?. Welp friends, those days are long gone. Duplicate web copy and low-quality blog posts aren’t only signs of an outdated website, they are also grounds for penalization from Google. 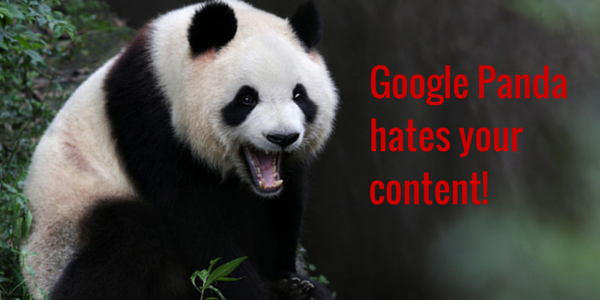 With Panda updates rolling out more frequently, websites that engage in duplicate, thin, or otherwise spammy content creation are at risk of losing rankings, or even de-indexing of certain web pages. If you are guilty of creating poor content, or your site’s content hasn’t been updated in a long time, you should make this a top priority. How much is 1 second worth to your website? According to KISSmetrics, a LOT. They found that a 1 second delay in page load time can result in a 7% decrease in conversion rate. For an e-commerce website making $100,000 per day, that equates to a whopping $2.5 million in lost sales each year. So yea, site speed is important. If it takes your web pages more than 3 seconds to load, there’s a good chance you need to make some updates. Optimizing your images, compressing page components, and minimizing HTTP requests are just a few updates you can make to improve your site’s speed. Although not necessarily a direct sign of an outdated website itself, having a low PageRank is a symptom of larger issues that should be addressed ASAP. It it’s simplest form, PageRank is a measure of a webpage’s relevance and importance in the eyes of Google. While links are an important factor used to determine PageRank, things like page load time, recency of content, page updates, keyword optimization, and other technical factors all play a significant role. If you haven’t had created new content or updated your website in awhile, your PageRank may be suffering as result. There a ton of free PageRank checking tools that you can use to identify issues and adjust the outdated areas of your website. These are just a few of the signs that tell users and search engines your website is gathering dust. Speed, social media presence and a mobile-friendly design are vital, as is thoughtful, relevant content creation. Get with the times and ensure that your site is up to date! This article was written by Zac Heisey from Business2Community and was legally licensed through the NewsCred publisher network.